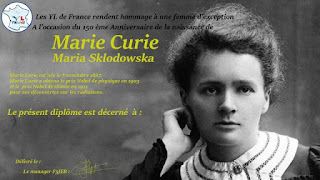 The association of the “YLS of France” have created an award in honour of the first woman scientist who obtained two Nobel prizes. The award rewards all contacts with the list of YLs below. Each contact is worth 10 points and all contacts with MARIA F6BAT are worth 20 points. Each YL can be contacted only once on a band with the same mode. Authorised modes SSB, CW, DIGI. The award is attributed once 100 points have been attained. The award is free (electronic version only). 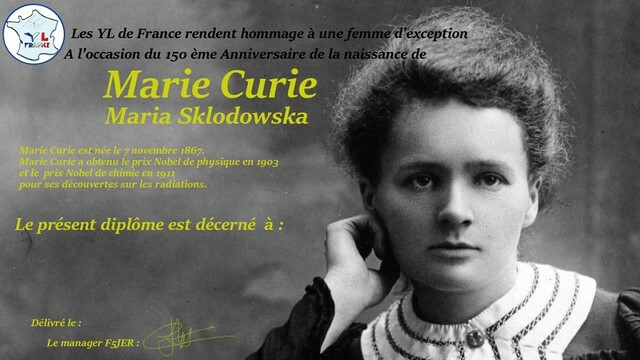 Marie and husband Pierre Curie were awarded half the Nobel Prize in Physics in 1903 for their research on the radiation phenomena discovered by Henri Becquerel, the other half recipient. In 1911 Marie Curie was awarded the Nobel Prize in Chemistry for her discoveries and studies of the elements radium and polonium. She is the only woman so far, who has been awarded the Nobel Prize twice. She was also the first woman to become a professor at the University of Paris, and in 1995 became the first woman to be entombed on her own merits in the Panthéon in Paris. In 1898 the Curies discovered two new radioactive elements: radium (named after the Latin word for ray) and polonium (named after Marie's home country, Poland). In 1895, Wilhelm Roentgen discovered the existence of X-rays. In 1896, Henri Becquerel discovered that uranium salts emitted rays that resembled X-rays in their penetrating power. Marie Curie not only made huge contributions to the fields of physics and chemistry, but also to the world of medicine. Curie had studied x-rays and x-ray machines and her newly discovered element radium, as the gamma ray source on x-ray machines allowed for more accurate and stronger x-rays. She created smaller and portable x-ray machines that could be used by medics in the field during World War I in 1914, saving many lives. Because of their levels of radioactive contamination, her papers from the 1890s are considered too dangerous to handle. Even her cookbook is highly radioactive. Marie Curie's papers are kept in lead-lined boxes, and those who wish to consult them must wear protective clothing. Vimy Ridge, a WWI battle site, is an escarpment 7 km in length in the north of France, part of the “Western Front” of WWI. Occupied by German forces after 1914, attempts by the French and British forces to take the Ridge had repeatedly failed with heavy casualties. In April of 1917, four Canadian Divisions, captured Vimy Ridge, which remained in Allied hands for the rest of the war and served as the base for the wireless operations of the Canadian Corps of Signals. In 1922 France ceded to Canada 100 hectares at the summit of Vimy Ridge to be used as a park for a monument. Every year, thousands of Canadians make the journey to view the monument, inscribed with the names of the Canadian soldiers who were lost or missing and who have no known graves. The centenary of the Battle will be marked in April, 2017 by formal ceremonies to be held at the base of the monument which will be attended by Heads of State. TM100VIMY, Vimy Ridge, will operate from April 1 to April 9, 2017. Organized by the Vimy Commemorative Station Society, British Columbia. 2 stations on Vimy Ridge plan to cover 160-10 meters using CW, RTTY and SSB. For security reasons the shack will not be open to the public nor to visiting amateurs. Contact will have to be made the hard way – on HF. Operators have been recruited from across Canada and France. Buckeye Burr - Social Media...We Were First! As Social Media…Twitter, Snap Chat, Texting…continues to grow the analysis of its impact is becoming more challenged. Just how effective are these new forms of communication & do they do more harm than good. Well, when it comes to new methods of communicating it’s important to remember that Amateur Radio is, & always has been, first…in every way…creating & improving just how we talk to each other. We have the high bands, the low bands, microwave, satellite, code, sideband, RTTY, EME, SSTV, Packet & now DMR. We have repeaters, a technology known today & Cell Phones! Nearly a dozen or more ways to effectively communicate…& consistently communicate…without interruption & without damaging reputations & world order. What we do as Amateur Radio operators is all for the good…& all good…& we keep doing it & improving every day. When it comes to the real Social Media…WE WERE FIRST! I suppose this all seems a little esoteric but I think about it every time I see new headline quoting social media as the source of a major story. It makes me cringe & appreciate what we as hams do & the way we do it. We report & educate our stories responsibly using reliable technology with ethics & professionalism. One final word from the soapbox…. We have one other form of communication that works…the newsletters our clubs send every month. Well written papers without hidden agendas from editors & writers who care about their readers & the hobby they write about. 8-9 April, 2017 (2nd full weekend of April), from 16h00 UTC Sat. - 16h00 UTC Sun. CQ World Scouts is an annual activity organized by União dos Escoteiros do Brasil - UEB (Scouting Brazil) recognized by WOSM (World Organization for Scouting Movements). Main objective of this weekend world event is to promote activity between Amateur radio and Scouts. The more groups that join us the better our chance of picking up the Brasilian signals. During Jota-Joti 2016 positive reaction were expressed about this event. Everyone is encouraged to work one of the stations, if only to give points. On behalf of Brazilian Scouts you are invited to come and participate in the CQ World Scouts contest. We hope that many scouts and amateurs meet in this contest! Even though you may not have the entire 24 hours available, please join us! On the website: www.pi4sbr.com is a big part of that information in Dutch! From the 25 countries that formed the IARU in 1925, the IARU has grown to include 160 member-societies in three regions. The International Telecommunication Union (ITU) has recognized the IARU as representing the interests of Amateur Radio. Today, Amateur Radio is more popular than ever, with over 3,000,000 licensed operators! PERIOD Start: 1200 UTC, Saturday; End: 2359 UTC, Sunday. The city of Juiz de Fora is so-called “Manchester Mineira” (The Manchester of the State of Minas Gerais) for being one of the most industrialized cities in Latin America. Everyone around the world can work everyone and multipliers are for each DX country, in addition all South American prefixes are also multipliers. It’s a good contest to try if you don’t normally work a lot of South American stations. Our computers have become too easy to use. Right out of the box, they’re ready to go. No installing operating systems, no typing into a command-line prompt like in the old days. We don’t even have to hit save any more. Most weeks, I’m the first to celebrate this and to say I miss nothing about the way it used to be. But not this week. 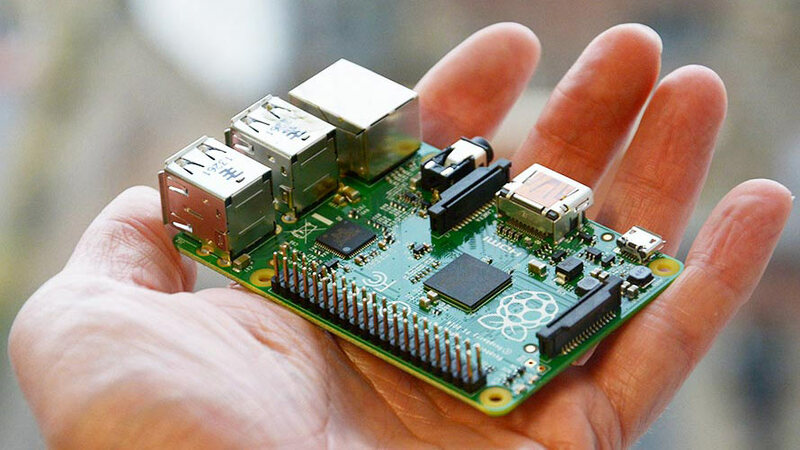 This week I’ve been using the $35 Raspberry Pi 2, a bare-bones Linux computer no bigger than a juice box. And I’ve rediscovered something I had forgotten: the thrill of tinkering with a machine and its software. Of course, that thrill is accompanied, from time to time, with the urge to take a baseball bat to an inanimate object. Sign on for one of the breakout sessions by Diane VK4DI on how to use Logging Programs, SDR Radio and Echolink. Bring your laptop or smart phone and learn how to install and use the software. TREASURE HUNT! Form a Team and take part in a Foxhunt among the tropical gardens. TRAIN OR SKYRAIL TO KURANDA Meet at Cairns Station for Kuranda Scenic Train departure which takes 2 hours to ascend the winding Range, passing through tunnels, with stunning views of the gorges as you ascend to the scenic, cooler-climate Atherton Tablelands. Or from the Skyrail Base at nearby Caravonica ascend in Gondolas, skimming treetops with views of the rainforest and the Barrier Reef. The more we “Talk Radio”, the stronger our sport/hobby will be, so enjoy this issue and please share it with your friends.